One of the best films of 2014, Ruben Östlund’s Force Majeure deals with marital dynamics and what a split-second, instinctual reaction reveals about a man’s character and priorities. But it examines these issues through the family unit as a whole, which starts in perfect syncopation, slaloming through the powder at an Alpine ski resort, and falls out of rhythm in the wake of a “controlled avalanche” that veers out of control. And that’s where Östlund’s sensibility lies as a director: He observes people from the marked distance of a cultural anthropologist, concerned less with observing individuals (though he does better with that in Force Majeure) and more with group and societal dynamics. His films are like controlled experiments in which he applies some form of intense external pressure and watches how his characters alter their behavior in kind. He’s a cruel, exacting scientist. Take a scene from his 2008 roundelay Involuntary, which along with 2011’s Play, is getting its first U.S. theatrical run as part of a touring Östlund retrospective. A schoolteacher (Lola Ewerlund) calls an adolescent girl up to the front of the class and shows her a picture with two lines, one slightly longer than the other. When asked which of the lines is longest, the girl points to the correct line; however, when the teachers asks the rest of the class, they choose the other line. This happens a second time, too. On the third, the girl picks the smaller line. The teacher has conspired with the rest of the class to demonstrate the power of groupthink and peer pressure, and it’s no small irony that the teacher herself runs into the consequences later on. When she observes another teacher manhandling a rambunctious student in the hallway, she calls him out for it, which profoundly affects her relationship with her peers, who are naturally inclined to close ranks. Elsewhere, other characters make choices that either put them in line with a larger group, or brutally alienate them: A rich man (Villmar Björkman) celebrating his birthday decides to keep the party going after a firework hits him in the face; a drunken gathering of bros turns sour when one of them (Olle Liljas) is pinned down and briefly fellated as a joke; and a bus driver (Henrik Vikman) adamantly refuses to leave a rest area until the passenger who snapped a curtain rod in the bathroom steps forward. None of these stories intersect. Östlund is merely presenting a handful of case studies to support his thesis on the terrible choice between conforming or defying the will of a group. There are no good options for anyone in Involuntary: If the teacher supports her peer, she fails to protect a student; if the fellatee doesn’t protest his friend’s violation, he has to live with humiliation; if the bus driver lets it go, he loses control of his little fiefdom. Beyond theme, however, these stories are united by the agonizing, low-level tension Östlund brings to bear on every scene, which vary in importance, but not in consequences for the characters involved. They are the still-fluttering butterflies Östlund has pinned to the board, mercilessly tugging at the wings. Though the groupthink remains the same, Östlund ventures into still more provocative territory with Play, which introduces a troubling racial component to an agonizing daylong bullying incident. 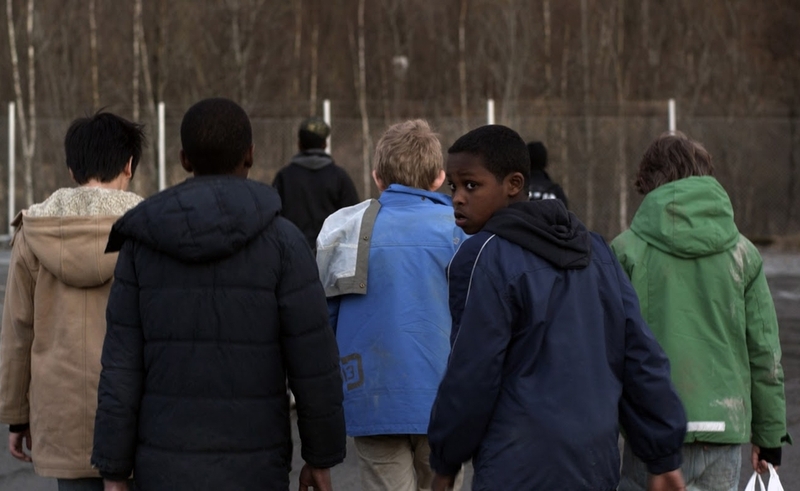 Opening in a mall in Gothenburg, Sweden, the film starts with five boys of African descent targeting three middle-class friends—two of them white, the other Asian. With only the vaguest threat of violence, the gang works a clever scheme to separate one of the weaker kids from his cell phone: They ask to look at the phone, claim their friend lost one with the same cover and distinctive cracks on it, and ask if they’d mind showing the phone to their friend. So begins an odyssey in which the three kids are cajoled into traveling around the city with the bullies all day while being subjected to various forms of humiliation and rigged “games.” (If Michael Haneke, a director frequently compared to Östlund, hadn’t already titled a movie Funny Games, it would suit this one just fine.) And yet none of these torments come as a result of physical abuse—it’s all intimidation and psychology. It’s possible—extremely possible—to determine that Play is simply racist, as it depicts a black gang robbing and tormenting fairer-skinned Swedes. But Östlund’s agenda is more complicated, in that not all the bullies are equal participants (one bows out halfway through), the dynamic is as much class as race-based, and white perception of black teenagers figures strongly into the scheme’s effectiveness. In other words, there’s leverage to be gained from being feared irrationally. None of this absolves Östlund from criticism, but little about his work is simple-minded or cut-and-dried. His films marinate in viewer discomfort. Play also marks Östlund’s extraordinary growth as a stylist, starting with an opening shot reminiscent of The Conversation in the way it surveys a scene (in this case, a mall lobby) broadly before zooming in on the source of conflict. Much of Play unfolds in long takes from a middle distance, so Östlund can get an overview of an entire situation in a single shot. The camera perspective offers another persistent theme: Nobody does anything to help the bullied kids, even when it’s perfectly obvious that they’re being held under duress. It’s in our nature to avoid conflict and to look the other way. It’s Östlund’s instinct to engage.